With #OffTheBeatnTrack around the corner, we sent our Scenic Driver, Quinton on a mission. Quinton was sent on a mission to summit the highest point of the Magaliesberg Mountain Range and plant a flag, designed by one of our Scenic Drive listener. 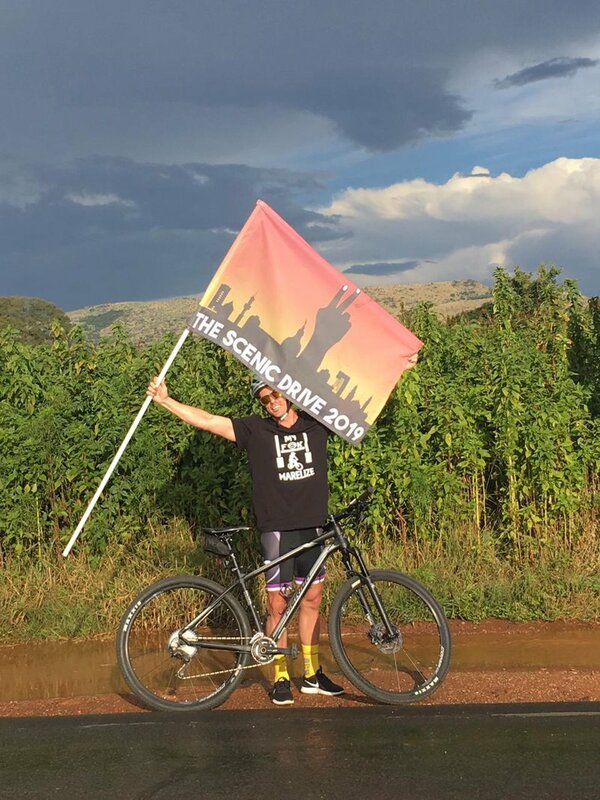 He set off on a mountain bike earlier today and armed with the Scenic Drive flag. The highest point of the Magaliesberg is reached at Nooitgedacht, about 1,852 meters above sea level. A cableway reaching to the top of the mountain range is located at Hartbeespoort Dam, providing sweeping views of the Magaliesberg and the surrounding area. He started his journey at Hekpoort just outside Hartbeespoort Dam. Quinton will eventually reach the foot of the mountain where a vicious 5km uphill battle awaits him to the top of the Magaliesberg. He will plant the Scenic Drive flag at the highest point on the Magaliesberg (Nooitgedacht).